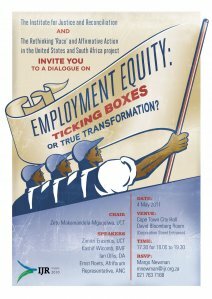 On 4 May 2011, the IJR co-hosted a public Dialogue on Employment Equity: Ticking Boxes or True Transformation, together with the Rethinking ‘Race and Affirmative Action in the United States and South Africa project. After excellent inputs from panelists Dr. Zimitri Erasmus, Ian Ollis, MP, Kashif Wicomb, Ernst Roets, and James Ngculu, guided by Zetu Makamandela-Mguqulwa, it became clear that many at the event wanted to continue an important conversation about our national equity goals, and how best these can be achieved. This page serves as a site to continue the Dialogue we started at the City Hall. Please leave your comments and questions below, and I will post new pictures and other content as it becomes available. Ground Rules: The Dialogue set the tone for a respectful and constructive conversation – lets keep this going! Differing views are welcome, offensive language is not! 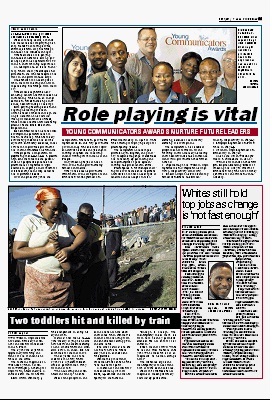 UPDATE 1: An article entitled Whites still hold top jobs as change is ‘not fast enough’ appeared in The Sowetan on Friday, 6 May. UPDATE 2: Have a look at pictures taken by Michaela Verity at the Dialogue event – more by the same photographer on our Flickr stream are also available here. UPDATE 3: Video footage of the panelists has been uploaded to our YouTube stream – I am also including these below. UPDATE 4: If you haven’t read it yet, I want to recommend this article by Zimitri Erasmus, which appeared in the SA Reconciliation Barometer newsletter in 2010. UPDATE 5: Inputs from all Dialogue panelists have been re-published in the latest issue of the SA Reconciliation Barometer newsletter – read and comment online here or download the full PDF here. UPDATE 6: Read the recently-released 2010 annual report of the Commission on Employment Equity here.